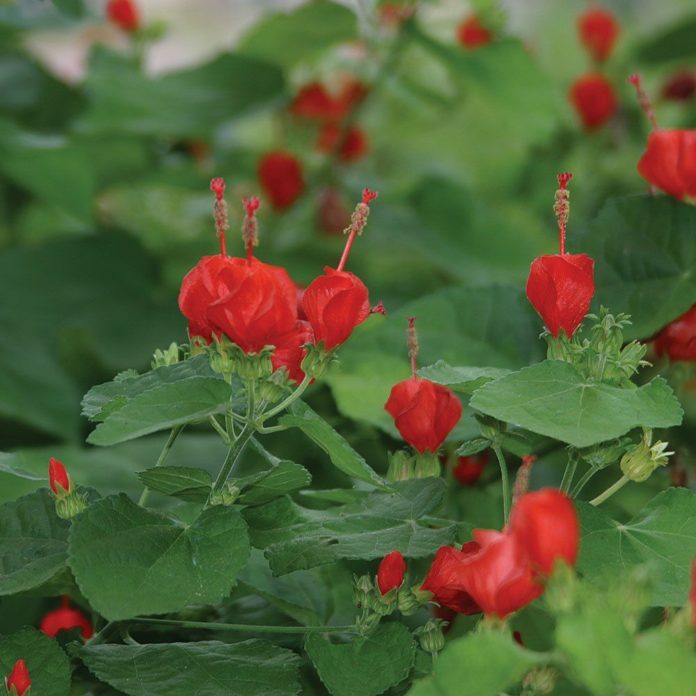 Plants such as our native turk’s cap work well along the top edge of a rain garden. The Hidalgo County Master Gardeners and Texas A&M AgriLife Extension Service are holding a Fall Garden Festival and Plant Sale with free educational workshops at the South Texas Master Gardener Educational Garden in North San Juan Park from 9 a.m. to noon Saturday, Oct. 20. Workshops include several hands-on demonstrations such as Container Gardening (9:30 a.m.), How to Make a Rain Barrel (10:15 a.m.) and cover Composting (11 a.m.). The Master Gardeners will have rain barrel kits available for $50 for those participants who would like to put together their own rain barrel. Kits have to be reserved in advance by calling (956) 383-1026 and can be paid for at the event. In addition to the outdoor workshops, the Master Gardeners will have a plant sale. Landscape plants include Duranta, Hawaiian Snow Bush, Indian Carnation, Shrimp Planta, Philodendron selloum and more. Additionally, there will be a selection of native plants to support butterflies and hummingbirds. Additionally, the South Texas Border Chapter of the Master Naturalist’s will hold a free seed exchange with native plant seeds, nectar plants and non-hybrid vegetable seeds. The Master Gardeners will also conduct a silent auction featuring gardening books, tools and garden art. They will have bi-lingual guides located throughout the gardens to answer questions about the plants. The individual theme gardens inside the Educational Garden are well marked with the scientific names and common names for each plant, along with some important information about the plants performance. The South Texas Educational Garden is located in the North San Juan Park at 509 East Earling Road, which is an extension of the Nolana Loop in North San Juan. The Park is a 15-acre plot located behind the North San Juan Multi-Purpose Center on the south side of E. Earling. The South Texas Educational Garden is located within this Park and is marked by a large welded gate in the shape of a tree. Watch for the signs guiding participants to the “Educational Garden.” A map with the location of the Park is available from the Texas A&M AgriLife Extension Service in Edinburg. For more information, call (956) 383-1026. Today, you can also pick up a copy of the map and information on the Festival at the Growing Growers Farmers Market in Firemen’s Park on the corner of 1st Street and Business 83 in McAllen. This will be a fun event for families and a great opportunity to see the garden when many plants are in bloom and butterflies are abundant. Entry to the Fall Garden Festival is free. Proceeds from the plant sale and silent auction event support the many free workshops the Master Gardeners provide during the year. Master Gardeners are available at the Growing Growers Farmers Market from 9 a.m. to Noon today to discuss all of their upcoming classes and events and to share gardening advise. Barbara Storz is a local horticulturist. You can listen to her garden show at 7 a.m. Saturdays on 710 KURV Radio. Contact her by email at bstorz@rcommunications.com.